Fact #1: 99% of all colorblind people are not really color blind but color deficient; the term color blindness is misleading. Fact #4: “What color is this?” is the most annoying question you can ask your colorblind friend. Fact #14: Color Vision Deficiency would be a much better term. It describes the actual [situation] to the point but it is not well known in common speech. 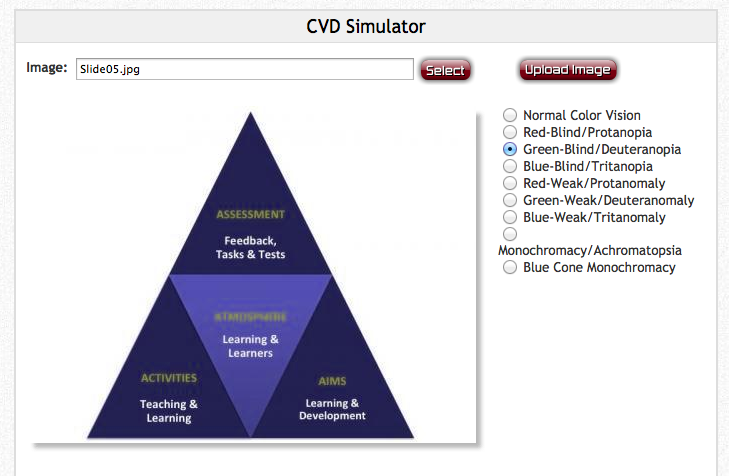 Overall, about 8% of men, and .5% of women experience Color Vision Deficiency. In creating diagrams, charts, images, or SmartArt for use in courses, presentations, and publications, understanding how some of our colleagues will perceive these color-based images can help us in both the development and descriptive aspects of image design. 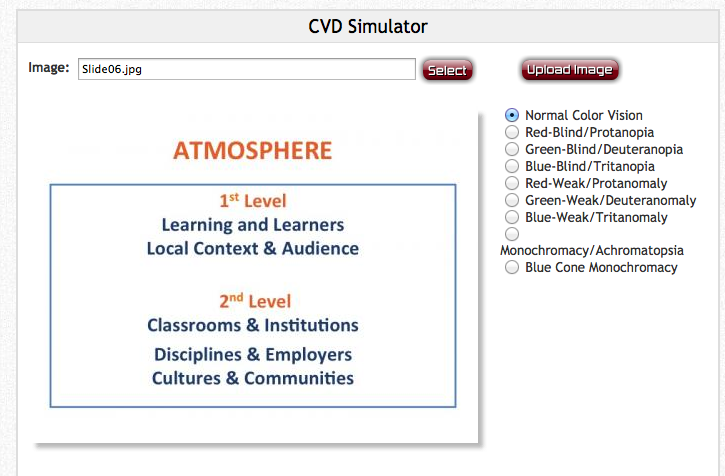 This post introduces one tool that detects appearances of color across a wide spectrum of CVDs, and then offers three suggestions for academics to consider as we create color-coded diagrams and color-rich images. To see how a diagram, image, or piece of SmartArt looks to colorblind students and peers, you can try out specific images you plan to use via the Coblis – Color Blindness Simulator. 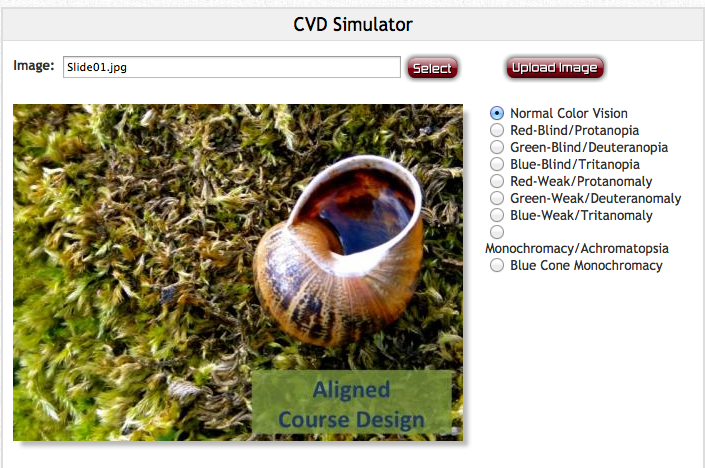 This online tool allows us to shift our visual gaze to see how that particular image looks across different forms of Color Vision Deficiency, CVD. 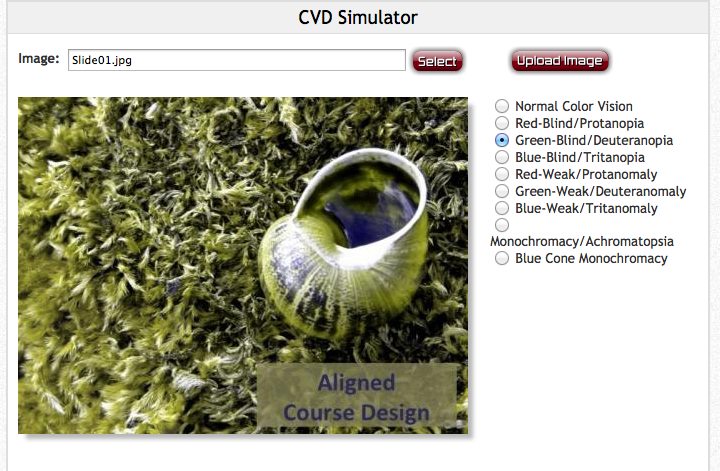 The samples below are pulled from a slideset I use frequently in speaking about course design. Testing these was as simple as opening the .pptx file, then opting to create a new file via “Save as Pictures,” and uploading select images to the Coblis interface at http://www.color-blindness.com/coblis-color-blindness-simulator/. I’ve uploaded JPG, GIF or PNG images files for other types of documents as well – often making use of screenshots to capture web- or text-based images making use of color for testing out on the site. The upload needs to be sized below 600KB. 1. 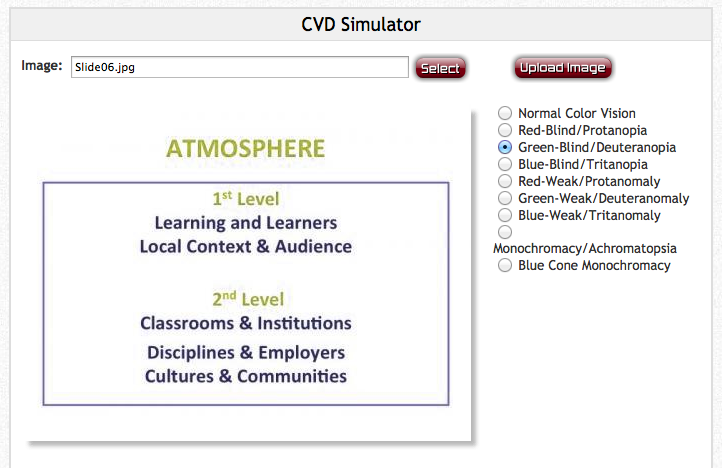 I’ve worked with only a very small number of students experiencing CVD, By taking time to review the color palate of my default template in branding and designing slidedecks and other color-rich visual texts with these students in mind, I became aware of accessibility adjustments I will be able to make should colleagues and students request alternative representations. 2. I have learned from a number of students that being able to hear or read verbal descriptions of images greatly enhances their perception and understanding of a color-rich resource. For example, in the image just above this paragraph, I’ve learned to speak about the light-toned triangle at the center as being the focal point of the diagram, with the bolder-hued outer triangles as coming together in support of that central point. This verbal description links conceptual elements to the diagram in ways that images alone cannot, which supports an even broader range of students as they come to understand new – core, threshold – concepts through written, visual, and verbal cues. 3. In developing this oral description, I begin am essentially beginning to draft the wording for alternative text for blind and visually impaired students that I can then add to the particular document file as Alt-Text, as part of a Notes or Comment field, or as a Sticky Note. 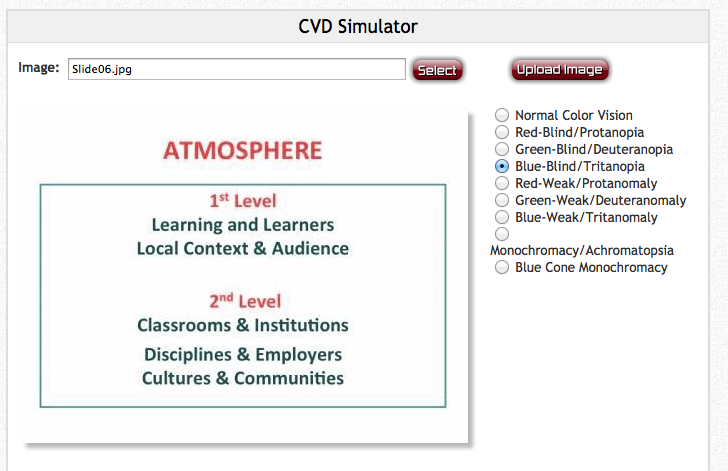 Again, in making this change – which began with a need to distinguish among and make sense of color hues and tones – I am positioned to make the documents I create accessible to a broader range of students or colleagues before, during, and after a class or conference session.